The Grand Bazaar includes 61 covered streets and over 4,000 shops which attract between 250,000 and 400,000 visitors daily. In 2014, it was listed No.1 among world's most-visited tourist attractions with 91,250,000 annual visitors. 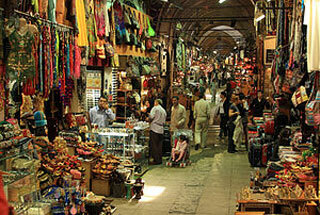 The Grand Bazar at Istanbul is often regarded as one of the first shopping malls of the world. This article uses material from the Wikipedia article "Grand Bazaar", which is released under the Creative Commons Attribution-Share-Alike 3.0 License.